"Doing Good While Doing WELL"
The Village Drill can do for clean water what the Model T has done for transportation. Made by Africans for Africans. People with great intentions often travel to developing nations & give stuff away. But sometimes it's just a Band-Aid on a bigger injury. This drill project is designed to empower Africans to bring clean water to millions of Africans. Are you interested in addressing the problems surrounding scarce & contaminated water? We have a solution. 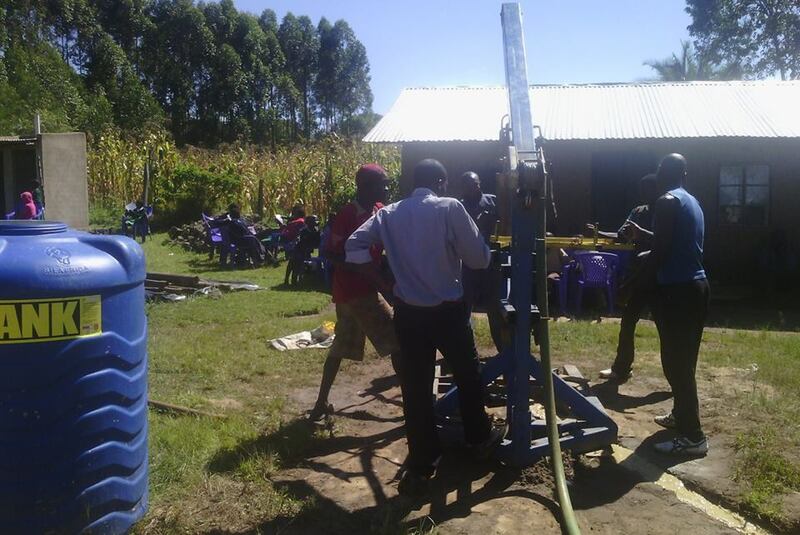 The new standard in borehole drilling and giving a "cup of water." This PORTABLE drilling rig COSTS LESS than one well drilled the traditional way with a standard hydraulic drilling rig. This drilling rig doesn't drill just one hole. It keeps on drilling dozens of holes every year -- providing on-going jobs for at least ten men per Village Drill. THE PROBLEM. One in six people in the world lack safe drinking water. 1.1 billion people in the world do not have safe drinking water available to them. 2.2 million people in developing countries, most of them children, die every year from diseases associated with lack of access to safe drinking water. PROBLEM SOLVED. 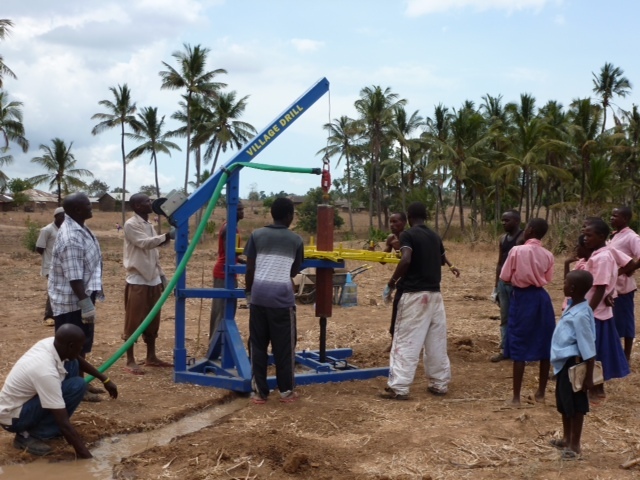 By creating the "Village Drill" (a unique, human powered water drilling rig) we can now bring water to millions of people throughout Africa. This is a real solution. The delivery of this unique water drill will provide new hope to the families of the 3.75 million people that die and the nearly 1 billion who suffer every day from scarce and contaminated water. ASTONISHING INVENTION. The human-powered drill is patented & tested technology designed by engineering students as a class project (with John Renouard's help), to drill a 6" borehole up to 250 feet deep, accessing the deep & clean water that exists nearly everywhere in the world -- even the arid regions of Sub-Saharan Africa. Once the borehole is complete and the well pump is attached a village instantly has the lifesaving water that will be the start of their rise from poverty. Clean Water = Health. Health = Greater Opportunity. Our Guarantee. Every penny donated -- except for the gofundme 5% online processing fee -- will go toward the purchase of a Village Drill. Plus, we will keep up with everyone who donates to let you know where the drill is operating and who it is employing. Everyday Matters Magazine is the sponsor of this particular fund-raising project. We are encouraging every advertiser and reader -- or anyone else who happens to bump into this page -- to donate. You'll be glad you did. Many organizations spend more for one well drilled the traditional way than what this virtually-indestructible "unlimited-number-of-wells" human-powered drilling rig costs. In developing countries two things are readily available: people-power & time. A group of local men can go from village to village throughout the region drilling wells for a fraction of the cost it would cost to drill wells in the traditional way -- and still make a respectable income to support their families -- at the same time providing fresh, clean water to yet another village. As an example, in many parts of Africa the average income is about $250 - $500 a year. This business opportunity can be a positive game-changer for many families and villages. Imagine this entrepreneurial scenario happening all over the continent of Africa! You can help make it happen. It takes the "Village Drill" to raise the village. We now have over 20 of these drilling rigs operating in various parts of East Africa...and expanding. Can an individual here in the US buy one of these? I support your cause. No one should go thirsty. Good luck to the people involved in this project. Thank you.